It is rare for a Kansas contest to earn mention in the MaxPreps’ weekly top-10 games around the country. However, this week, Class 6A No. 2 Blue Valley at Class 5A No. 1 Mill Valley is a marquee matchup that has garnered nationwide interest alongside traditional powers such as Paramus (N.J.) Catholic, St. John (Calif.) Bosco and multiple Texas schools. Blue Valley is the defending Class 6A runner-up to Derby, while Mill Valley is the reigning 5A champion. The duo, along with Derby, No. 1 in 6A, are arguably Kansas’ three best teams. This marks just the second time the squads have played; Blue Valley won 38-0 in the 2013 playoffs. Mill Valley, now 15-1 in its last 16 contests, is trying to navigate the weekly grind of joining the Eastern Kansas League for the first time this season. In 2015, the Jaguars’ regular-season schedule included a win against 6A champion Derby and a 28-21 loss to Missouri powerhouse Staley. Both the Jaguars and Tigers are unbeaten and own a key Week 1 victory. 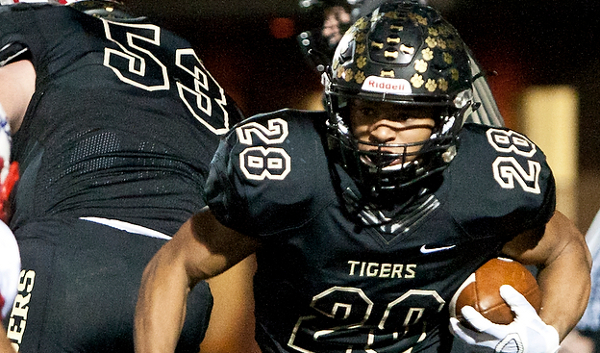 Blue Valley held of Class 4A, Division I No. 1 Bishop Miege, 35-28, for the second straight season. Mill Valley won, 35-13, against St. James, which began the year ranked in Class 5A. Both squads have comparable aggregate scoring with similar offensive frameworks and few returning defensive starters. Mill Valley has outscored opponents 113-56, while Blue Valley owns a 109-42 margin. The teams each have first-year starting quarterbacks. Jaguar junior Brody Flaming has completed 68 of 118 passes for 1,178 yards with 12 scores against one interception. Applebee called Flaming, the former junior varsity quarterback, a player who understands the game well and loves football. “He’s very excited every day to be in the film room and get better,” Applebee said. The Jaguars passed on 33 percent of its snaps each of the last two years and averaged 7.3 and 8.1 yards per play. This season, Mill Valley has averaged 73 snaps a contest, passed on 54 percent and averaged 7.7 yards per play. Applebee wants to be a run-first squad but also calls plays on “what the defense gives us.” The veteran offensive line, led by seniors Keegan Zars, Jack Cooley and junior Mitchell Grissom, are smart players both on and off the field. Senior Ben Hartman has 26 catches for 523 yards and six scores. “We feel like we’ve got a great group of offensive linemen this year that are playing very, very well, and they are a group that we are going to rely heavily on,” Applebee said. Mill Valley, with just three offensive and two defensive starters back, has defended 16 passes and forced seven turnovers. Donn leads the squad with 47 tackles, four TFLs and one interception, while Rice has three INTs. Junior Ike Valencia, who moved from running back to defensive end, has four sacks. Senior Dylan Schmidt didn’t play last year and has been a consistent linebacker with 26 tackles. Senior Cole Ivey has an interception, forced fumble and seven passes defended. “Across the board, they’ve all played very, very well,” Applebee said. Blue Valley, with six offensive and two defensive starters back, has churned out 70 snaps a game and averaged 6.5 yards per snap. The Tigers have thrown on 53 percent of plays. Senior Matthew Dercher has completed 61 of 97 passes for 816 yards with nine scores versus two interceptions. Senior William Evans has 81 carries for 411 yards and three touchdowns. Blue Valley, long known for great offensive line play, had Driskell as the line coach for 14 years. Then, Driskell, 61-16 in his seventh season as head coach, turned the line over to assistant Lew Rowe. Blue Valley won the Kansas City-area King of the Trenches team camp this summer. Rowe, on staff throughout the last decade, leads a starting group that includes senior left tackle Kirrian Kirby, a Division I prospect and returning first team all-stater. Senior Wil Watkins is a returning starter at left guard, while senior Zack Willis starts at center, senior Jacob O’Leary at right guard and senior Grant Lahr is at right tackle. The latter three are all first-year starters, though Lahr did see some time because of injuries to other players in ’15. The defense, like Mill Valley, has forced seven turnovers. Driskell called the defensive play “tremendous,” especially after holding high-octane Miege to its lowest point total in a regular season game since a 21-19 victory versus Blue Valley West on Oct. 11, 2013. The Tigers have a bevy of first-year senior starters. Seniors Baker Lister and Dawson Krug have stepped up at defensive line. Senior Ashkon Savari has emerged at linebacker, along with senior Zach Gill at outside linebacker. They have combined for 55 tackles and three sacks. Senior Trenton Schroeder missed the first game with a foot injury and has done well at free safety. Senior linebacker Michael Maffry, a returning starter, leads the team with 42 tackles and has two interceptions to tie with senior Brody Jacobsen for the team lead.